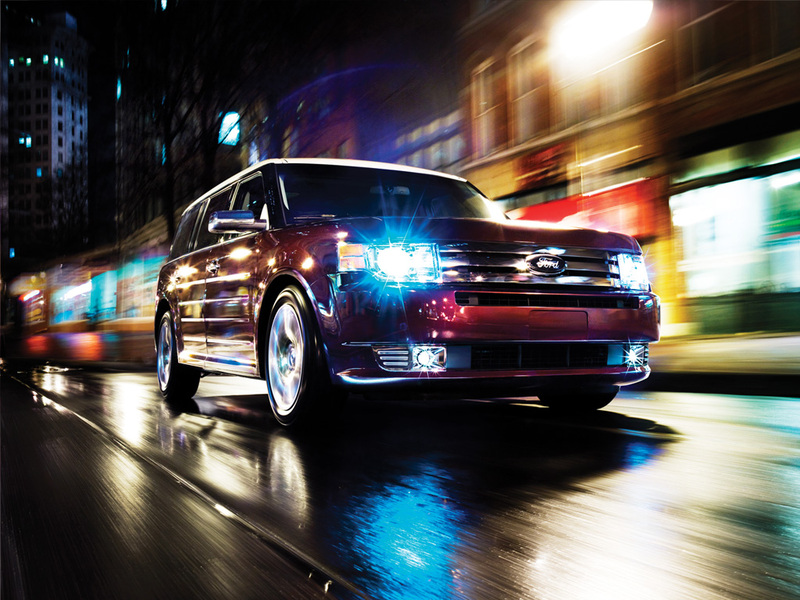 Ford Flex Review: Ford had a great run with the Explorer SUV in the 1990s. Today many families still want and need the Explorer’s virtues, but would rather have a tall car than a domesticated truck. With its “floating” roof panel, all the window pillars are blacked out, the new Flex looks a bit like a MINI Cooper on steroids. It is, however, much more imposing, weighing 4,640 pounds in its all-wheel-drive configuration, and stretching nearly 17 feet long. Ford first showed the Flex as a concept car, and based on a very positive reaction, delivered a fairly faithful version to consumers this year. The design is less macho than an SUV. A distinct set of grooves along the doors is unique and is also mirrored inside on the center console. The roof is quite flat. The overall look is tailored, handsome, and even elegant. Inside, the ceiling is quite high. The materials feel substantial and blend well together. In my tester, the tan and dark gray-grained plastic, woodgrain, and black, silver and chrome accents worked together in a particularly harmonious way. Even the leather on the seats had an unusual perforation pattern. The wood along the top edge of the fat, leather-wrapped steering wheel matches up with the line of “woodgrain” trim on the dash when you’re pointing straight ahead. That’s a kind of subtlety not often found in previous Ford designs. Actually the Flex felt more luxurious than the Lincoln that I tested the week after! I cruised virtually silently in the Flex. Ford’s engineers designed in quiet by working to eliminate all wind noise, adding sound insulation material, and using a new inset side door design. The steering feels heavy and solid but the wheel turns easily. A dead pedal for the left foot is welcome. The illuminated cupholders (red) were an amusing touch. Less amusing was the lack of covered storage (and no apparent place to add a rear cover) and the serious slam it took to close the glovebox. You can get a Flex in three levels: SE, SEL, and Limited. The SE is nicely equipped, but the SEL adds heated leather seats with 10 adjustments for the driver and six for the front passenger, a 10-speaker Sony premium audio system, and machined rather than painted 18-inch alloy wheels. The Limited goes full boat, with 19-inch alloy wheels, upgraded leather interior, upgraded lighting systems, and a nice, fat silvery appliqué on the rear panel that helps the car stand out. All Flex models are motivated by Ford’s 3.5-liter Duratec V6, which puts out 262 horsepower and 248 lb.-ft. of torque through a six-speed automatic transmission. The standard front-wheel-drive models get EPA ratings of 17 mpg City, 24 mpg Highway, while the all-wheel-drive version, like my Black Clearcoat Limited tester, rates at 16 and 22 respectively. I averaged 17.1 mpg. The EPA Green Vehicle Guide gives the all-wheel-drive Flex a 7 for Air Pollution and 4 for Greenhouse Gas. The front-wheel-drive version improves the latter score to a 5. That’s acceptable for a big car, but nothing to get excited about. You can add many options to your Flex. One is the $1,495 Panoramic Vista Roof. This equal-opportunity sunroof gives everyone a piece of the sky. You can also order a second-row refrigerator ($760) for those long trips across the desert. My tester had a navigation system ($2,375), as well as Ford’s highly touted SYNC system. I played a bit with the SYNC voice commands. I asked it to find me a Starbucks and it cheerfully offered up barber shops! Oops. Also, at one point the disembodied voice asked, seeming out of nowhere, “Did you mean 72?” My wife and I are still laughing about that one. SYNC is not perfect yet, but once you figure out some of the commands, you can control numerous features by pressing a button on the steering wheel and asking for what you want. For example, you make changes to your iPod programming without touching the iPod itself. It plugs into a USB port, so it is charging while it sits, a nice benefit over a simple AUX jack. The Flex comes with Ford’s new Easy Fuel capless fueling system. Just pop open the fuel door and insert the gas nozzle. It seals back tightly when you close the little door. Very clever and much appreciated. Now no more lost gas caps, ever. Prices, including shipping, start at $29,250 for the SE, and move up to $33,025 for the SEL and $35,660 for the Limited. With options, my Limited model came to $43,820.